With the help of local volunteers JD, Peyton, and Beckie, the Grand Mesa Observatory and the Western Colorado Astronomy Club were very well represented at the 2018 Delta Career Fair. This event was held at the Paonia Energy Building in Paonia, CO and there were approximately 250 children visiting from the Cedaredge Middle School. Thanks to the great work of our outreach director Nancy McGuire, the astronomy display was the most eye-catching booth in the room and we had a lot of interest from students wanting to know about careers in astronomy and asking lots of great questions. Peyton, who is 10 years old and himself an aspiring astronomer, is the youngest member of WCAC and was instrumental in rousing interest among his peers at the event. He was very actively engaging other students and inspiring them about being astronomers, and as a result many of the students now want to visit the observatory and attend the public viewing nights we have scheduled. In addition to the student body there was a lot of interest from community leaders and career professionals who were present. One such encounter was with a man by the name of Art Trevena, who had his own geology display and who is also the vice president of Black Canyon Astronomy Club. After extensive mingling GMO Director Terry Hancock was even invited to do a talk at one of their club's meetings! This was another very successful event that helped put us in touch with the larger astronomy community in this part of the state. Much of the success was due to the impeccable planning of GMO staff, but without the help of our community volunteers its hard to imagine events like these being possible. 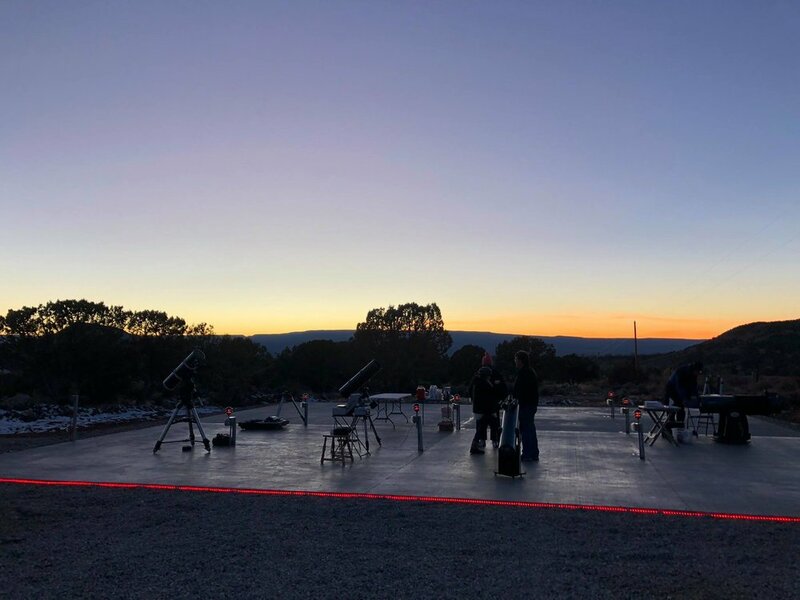 While the former John McConnell Math and Science Center was busy planning a move to its new facility in the brand new CMU engineering building, the Grand Mesa Observatory and the Western Colorado Astronomy Club were collaborating to provide a brand new astronomy exhibit to go with it! Eureka! McConnell Science Center had its grand opening on March 10th., 2018 and the new astronomy exhibit takes advantage of the soaring ceiling at the new location with a hanging, rotating, three sided, LED backlit set of astrophotos. All three images were taken right here at the Grand Mesa, with a selection of objects that includes the Andromeda Galaxy, the Pleiades star cluster, and the Horsehead Nebula region of the Orion Nebula. The panels are visually very stunning and as a result they draw attention to the display table below where virtual reality headsets wait to take visitors on a journey to space. In this age of unprecedented astronomical discoveries and wonders, the exhibit will be a living one with updates on new discoveries in the universe and space exploration, to be shared with the community. As the first official beta tester, it has been an honor working with Tom Masterson to help get our equipment ready for the general public. This image of NGC 2170 was the first data set Tom processed from the Grand Mesa Observatory, and hopefully it will be the first of many such amazing image to come out of this phenomenal facility. This type of data sharing is how we've envisioned one of our many subscription option will play out, in addition to the more standard fare of private scope rentals and dedicated pier hosting. This subscription option will eventually feature an object selection survey to give our subscribers more control over what targets are captured, but for now we left the choice in Tom's very capable hands. Once we begin publicly offering the data it will be available through the website, so make sure to keep checking back! At the request of Sky & Telescope Terry reprocessed his earlier color image as a monotone image. This new rendition combines color data (converted to Grayscale) with H-Alpha data to produce a very dramatic effect. Alnitak (below center), the easternmost star in Orion’s Belt, anchors a rich region of nebulosity that features the broad glow of IC 434, with the Horsehead Nebula (Barnard 33) silhouetted against it, and the Flame Nebula (NGC 2024) at bottom center. North is toward left. Image can be found in Sky and Telescope April 2018 pages 72 and 73.
in monochrome). Total exposure: 6.9 hours. Gain 2850, Offset 76 with Dark Frames no Flat. 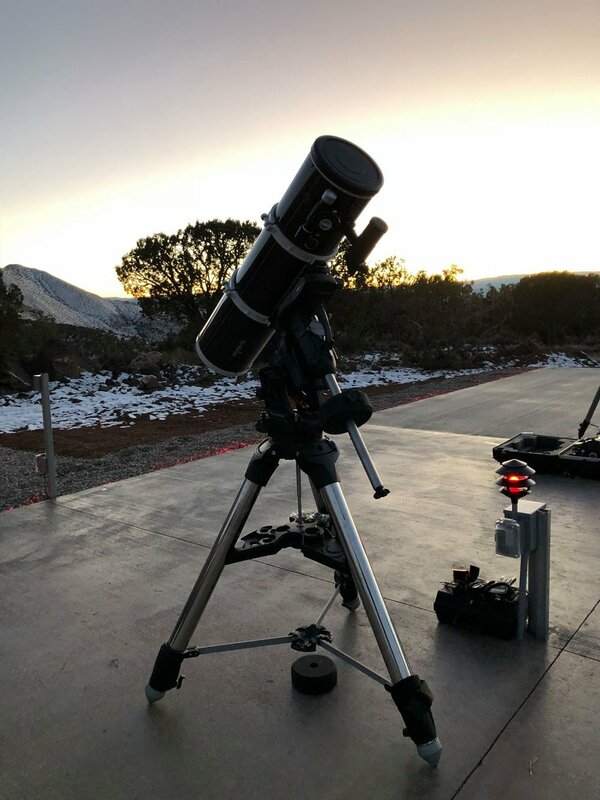 Seeing clear skies at dusk is exciting for any astronomer, but when you have such beautiful equipment at your disposal it becomes almost magical. From the enormity of the roof to the choreography of the Software Bisque mounts to the grand spectacle of our larger-aperture scopes, we hope you enjoy watching this video as much as we enjoyed making it! One of the latest images of The Heart Nebula captured at GMO was just featured in the European Blog "Universe Of Magic" as a commemoration of Valentines Day! Once again the outstanding work of Observatory Director Terry Hancock's has been featured in the January 2018 issue of Astronomy magazine, and this time it was even a double feature! The first image, which features the the Southern portion of the Orion region, appears on page 8 in conjunction with an article titled "The Beauty of Nebulous Space". The second image is of the Pleiades and was titled entitled "Seven Isn't Enough". This second image appears in the Reader Gallery on page 71. Both photos were taken using Grand Mesa Observatory's Takahashi 130-FSQ and QHY367c One Shot Color camera. Observatory director Terry Hancock had yet another image published in Astronomy Magazine, this time in their November 2017 issue. The image can be found on page 73 in the Reader Gallery. 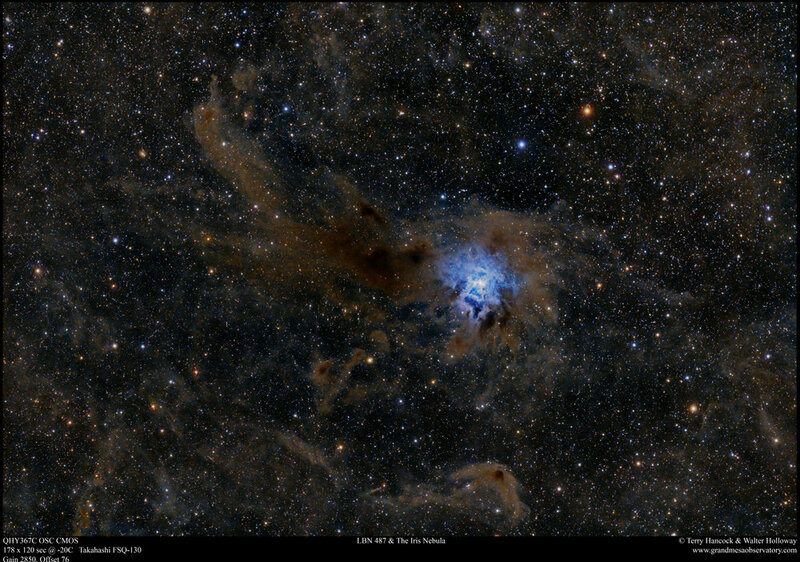 Entitled "Blue on Black", it was photographed using Grand Mesa Observatory's Takahashi 130-FSQ and QHY367c One Shot Color CMOS camera with the Iris Nebula (NGC 7023) and the surrounding LBN 487 region being the featured targets. Congratulations Terry! Great work as always! 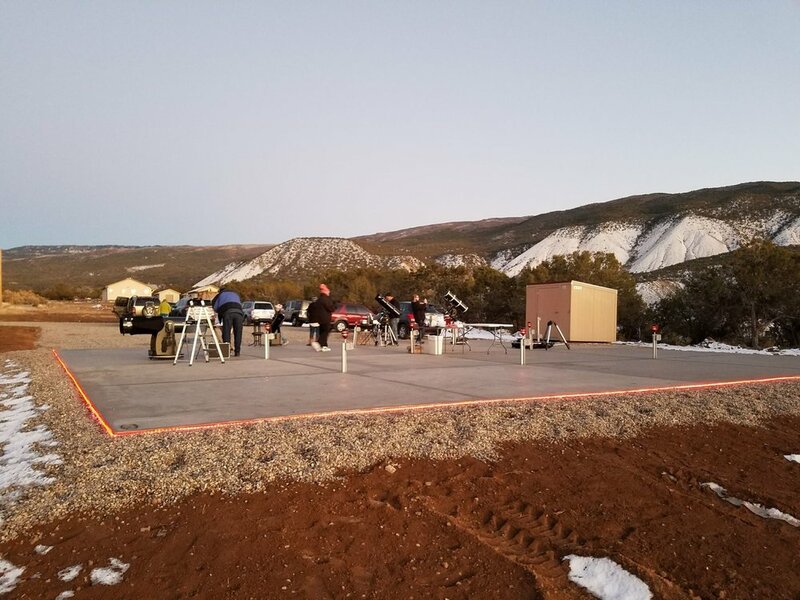 As many of our closer followers know, the Grand Mesa Observatory will soon begin offering world-class remote astrophotography from the dark skies of Western Colorado. However, as we prepare to open our doors to the global community we are also working hard to share our love for astronomy with the local community as well. 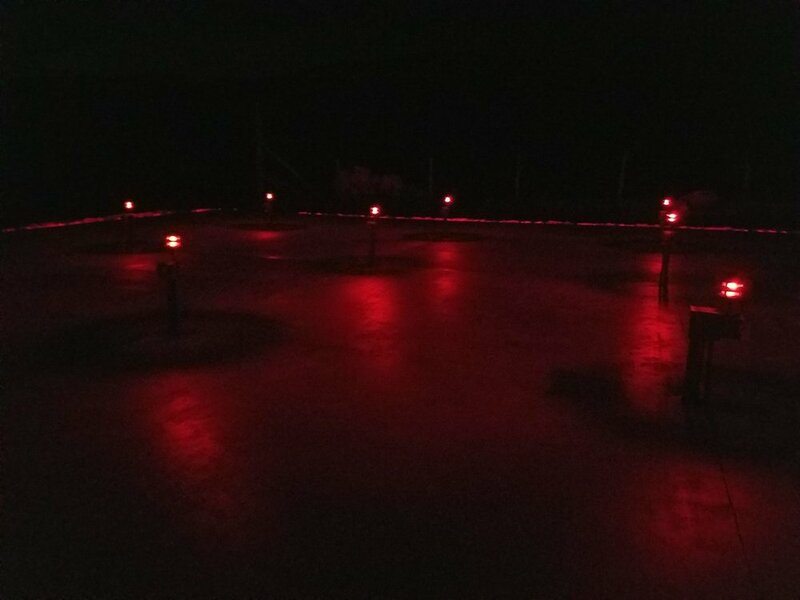 One of the most important parts of this outreach initiative officially went live this past weekend with our first-ever public star party from the brand new 50x50ft observing pad. This new structure has readily available AC power for all manner of telescopes, cameras, and computers, and now that it is complete we'll be using it for education and outreach purposes in conjunction with many local organizations and the local astronomy clubs. 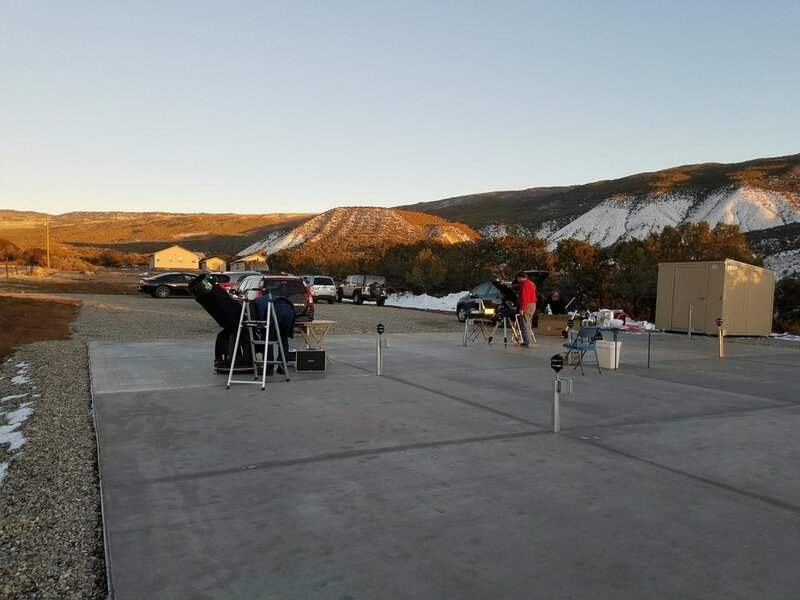 In fact, this most recent star party was hosted in conjunction with the Western Colorado Astronomy Club (WCAC), and thanks to our awesome board member Dr. Jared Workman we even had some guests from the Colorado Mesa University Physics department! Thanks everyone for coming out, and hopefully we can see some new faces next time!